Holiday Hodgepodge! | Dinosaur Dracula! It’s 10:55. If I don’t want to be a raving lunatic tomorrow, I have exactly one hour to get this post written, edited and published. Gonna have to rush. I’ll do my breast to avoid mistakes. In tonight’s Holiday Hodgepodge: Five Christmassy things, just in time for Thanksgiving! I haven’t paid much attention to Little Debbie over the years, but now that Hostess is dead, I guess I’ll need to. It’s a good year to start, because holy Moses, LOOK at these! They’re called Santa Brownies, and they are exactly that. Diamond-shaped brownies, determined to look as much like Santa Clauses as diamond-shaped brownies possibly can. All of Little Debbie’s Christmas snacks are pleasing to look at, but these Santa things take the cake and turn it into brownies. What really sells them are the stamped-in facial features. Look at those little eyes! And the crooked eyeglasses! I’ve always been a little iffy about Santa Claus, but this is a Santa that I can get behind. There is no mistaking that face for something unfriendly. 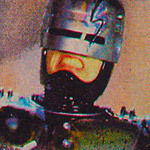 I love how the mouth conveys such a sense of confession. With just the right curve, it says so much. 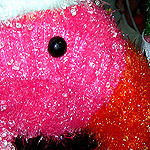 “I’m sorry, I know this is all a little ridiculous, but I hope you’ll let it slide, because man, I am adorb.” Santa’s a big fan of run-on sentences. Freeeeak. 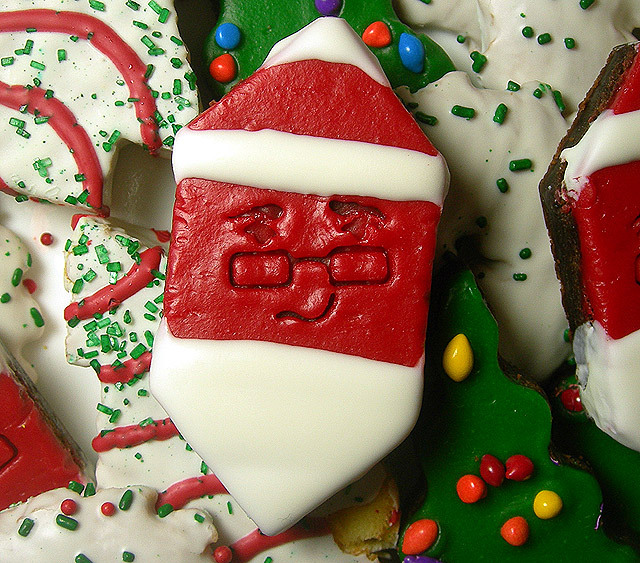 EDIT: Many have taken Santa’s “mouth” to be a nose. I concede that this is possible. Maybe even probable. But I like it better as a mouth, so we’re sticking with that. It’s time for my annual plea for everyone to try raw cranberries. They’re back in season, and they are delicious. Among us is a silent club of people who enjoy lemons and limes as we do apples and oranges. If you count yourself among those so blessed, trust me, you will LOVE raw cranberries. 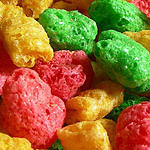 They’re sourer than lemons, but they still retain enough semblance of the abstract “berry” flavor to pass as them. They’re so, so good. And they’re good for you. I don’t have time to look it up, but I guess it’s something like 40 calories for a bushel’s worth. 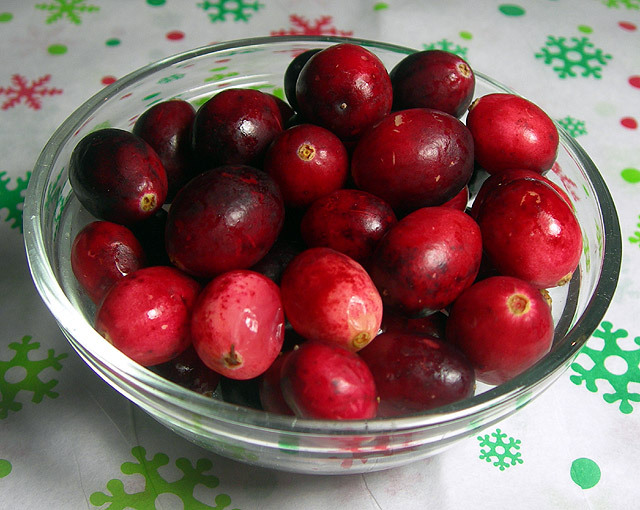 Raw cranberries also have the ability to make your mouth feel incredibly clean. Every time I eat them, I feel like I get a throat transplant. Even that’s understating things, because while technically a transplant, it’s more like I’m receiving a brand new custom throat, fresh off the conveyor belt from some godforsaken laboratory. 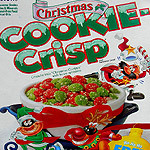 I can honestly say that I prefer raw cranberries to cranberry sauce, Craisins or any other cranberry-related foodstuff. They’re at their best when they’re unmolested. Sounds like a perfect setup for a joke, but goddamn, it’s already 11:15. This year’s “USB Christmas tree” isn’t as bold as the one I bought last year, but it was cheaper, and after spending my life savings on that also-pictured MacBook, ‘tis now the season to cut every conceivable corner. It’s not as breathtaking as last year’s, but it’s still pretty great. 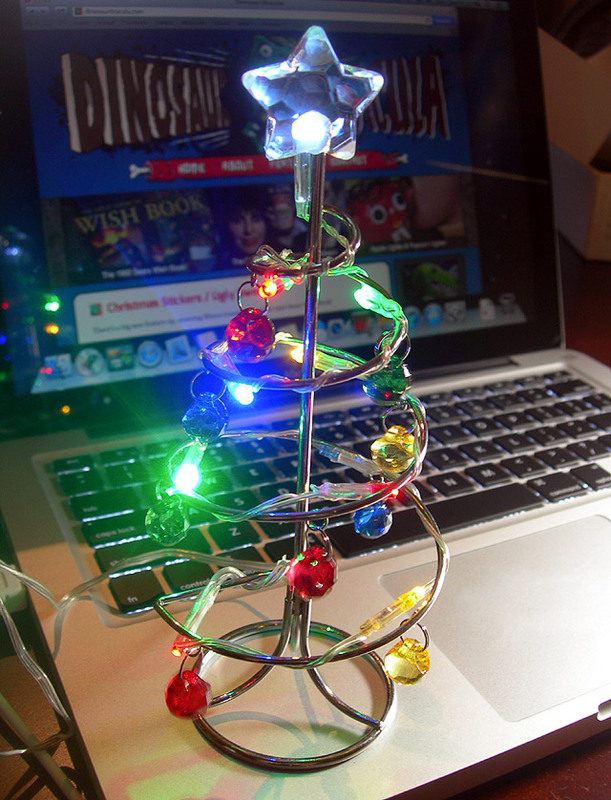 A USB wire brings several colored lights to life, and my only qualm is that the USB wire doesn’t do the same for the tree’s many ball ornaments. They look like they’re supposed to light up, but they don’t. It would take an awful lot of rigging to make those ornaments shine, but goddamn, I don’t have time for that. It’s 11:20! 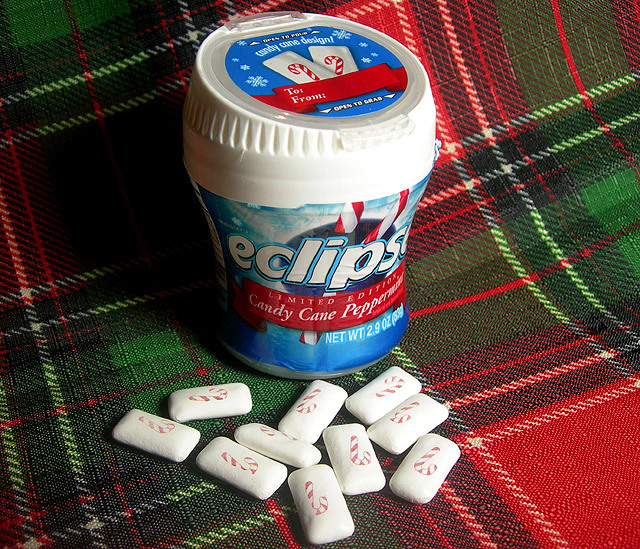 #4: “Candy Cane Peppermint” Eclipse gum. I grabbed this without really looking at it, and it turned out to be so much better than I imagined. Limited edition gum even as a concept is worth celebrating, but this is candy cane flavored gum, complete with little candy cane symbols on each piece. The gum really tastes like candy canes, too. I thought they were just creatively renaming an everyday peppermint flavor, but having chewed the stuff, I can say with all certainty that there really is a distinction between “peppermint” and “candy cane peppermint.” The first tastes like regular gum. The other tastes like a white December morning, filled with carols and reindeer. Make your choice, and it’s not a hard one. Unfortunately, you can’t get at the gum without totally wrecking the festive wrapper. I mean, you could, but since it’s now 11:30, I hope you’ll forgive me for not having spent an additional ten minutes tracing around the wrapper’s “plain” area with an X-Acto knife. I found these at Walmart, and as you can see, the price was right. I don’t know why 97 cents sounds so much cheaper than a dollar, but it does. I don’t know what to do with these. I don’t know why I bought them. I’ve been sitting here for four minutes trying to make up a reason, and goddamn, I don’t have four minutes to throw around like that. It’s 11:37! I have 23 minutes to spell-check, proofread, edit, post, link on Facebook, link on Twitter, link on Tumblr and go to BED. 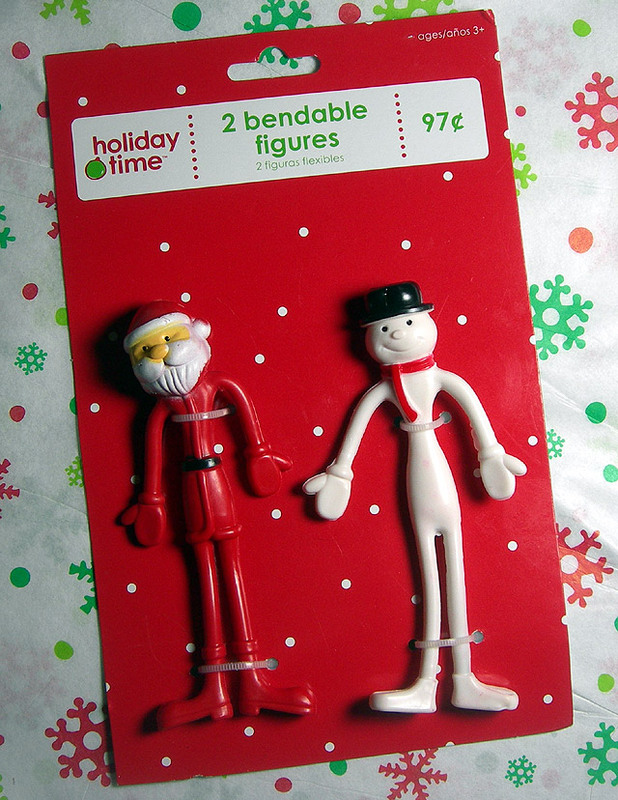 So, screw you and your impossible need to hear more about these stupid bendy figures. Tonight I run a picture gallery. The really big sites do well with those, anyway. PS: It’s entirely possible that I will change more than half of this post’s contents when I read it under the morning light. If you see anything screwy, come back later. 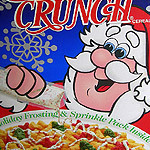 1995 Christmas Crunch with HOLIDAY FROSTING. 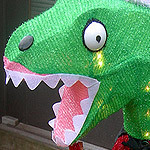 42″ Dinosaur Dracula, Christmas Edition.